Share your Favourite Creation Moment on Lego's 50th Birthday! Image From: Gizmodo. Click on the image for a larger version. Being extra busy early this week, I totally missed taking a “moment” on January 28 to wish Lego a Happy 50th Birthday! 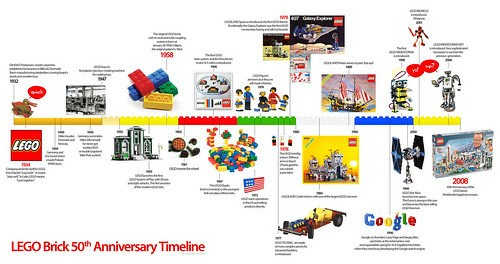 Check out the very cool time-line above created by Gizmodo, and their collection of “Best Lego Sets in History“! Being a child growing up in the 70’s and 80’s, my favourite sets would have to be the LEGO Star Wars collection, which I started collecting but gave up when I discovered the scope of product range and all the different boxes I had to buy! I also loved the Lego Technic range but could never afford buying any. After all these years, I can still remember my favourite Lego creation moment. I must have been at least 4 or 5 years old. One afternoon, I decided I wanted a gun to play with. (Don’t ask me why!) Not having any in the house, I proceeded to make one out of Lego blocks. It was a pretty simple design in sort of a capital “F” shape. I was pretty proud of myself, and proceeded to run around the house “shooting” at things. However what really made me mad, was the handle kept breaking off. You know Lego joints. Still breaking off, even after I stomped it with a heavy object, I proceeded to glue the joints up. Needless to say, my mom was not pleased! What about you? What’s your favourite Lego moment? I would love reading about it! • There are about 62 LEGO bricks for every one of the world’s 6 billion inhabitants. • Children around the world spend 5 billion hours a year playing with LEGO bricks. • More than 400 million people around the world have played with LEGO bricks. • LEGO bricks are available in 53 different colors. • 19 billion LEGO elements are produced every year. • 2.16 million LEGO elements are molded every hour, or 36,000 per minute. • More than 400 billion LEGO bricks have been produced since 1949. • Two eight-stud LEGO bricks of the same color can be combined in 24 different ways. • Three eight-stud bricks can be combined in 1,060 ways. • There are more than 915 million combinations possible for six 2 x 4 LEGO bricks of the same color. • 7 LEGO sets are sold by retailers every second around the world. • The LEGO bricks sold in one year would circle the world 5 times. • 40 billion LEGO bricks stacked on top of one another would connect the earth with the moon. • LEGO bricks are so much more than just toys. They are used in classrooms from preschool to university level to teach everything from math, language skills and science to engineering and technology principles. • The LEGO brick has inspired generations of innovators, like Jonathan Gay, inventor of Flash. • A January 2008 Google search produces 57.6 million references to LEGO bricks. • There are 55,600 LEGO videos on YouTube. • Google co-founders, Larry Page and Sergey Brin, used LEGO bricks to build the external low-cost and expandable casing for 10 4GB hard disks when they were busy developing the Google search engine (today, they have reportedly been used in Google’s college graduate recruiting exercises to test potential candidate’s creative horsepower). As a kid I had a medieval castle, a pirate ship (awesome), and a lunar rover which made me think like an engineer with the rotors, wheels, and gears. Good times! I loved lego as a kid too. Looking at these takes me back some. I used to spend hours in my bedroom making lego armies. I remember getting come kind of lego tropical resort with accompanying cocktail bar…ah for the days when not everything was censored for children! Those are great memories guys, thanks for sharing!